The castle is located on top of Mount Hohenzollern at an elevation of 855 meters (2,805 ft) above sea level, 234 m (768 ft) aboveHechingen and nearby Bisingen, both located at the foothills of the Swabian Jura. It was originally constructed in the first part of the 11th century. When the family split into two branches, the castle remained the property of the Swabian branch, which was dynastically senior to the Franconian/Brandenburg branch which eventually acquired an imperial throne. The castle was completely destroyed after a 10-month siege in 1423 by the imperial cities of Swabia. 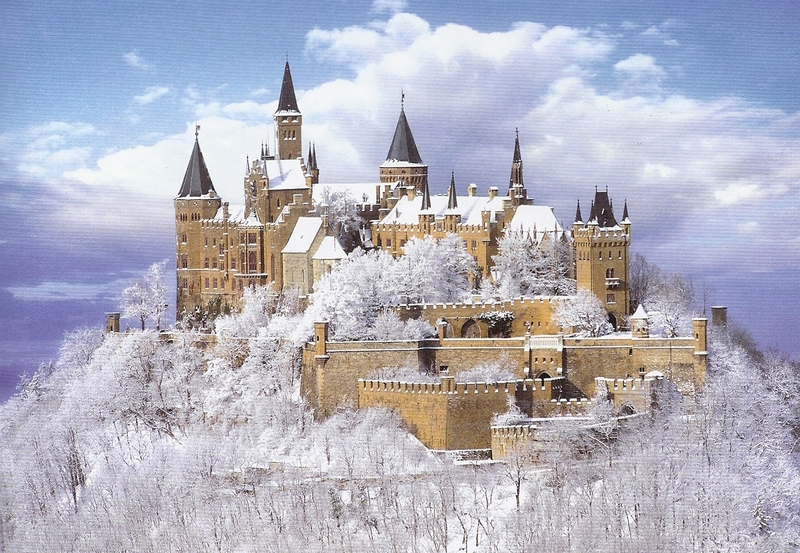 A second, larger and sturdier castle was constructed from 1454 to 1461 and served as a refuge for the Catholic Swabian Hohenzollerns during wartime, including during the Thirty Years' War. By the end of the 18th century, however, the castle was thought to have lost its strategic importance and gradually fell into disrepair, leading to the demolition of several dilapidated buildings. Today, only the chapel remains from the medieval castle. The third version of the castle, which stands today, was constructed for Frederick William IV of Prussia between 1846 and 1867, under the direction of Friedrich August Stüler, who based his design on English Neo-Gothic style as well as the castles of the Loire Valley.Because the castle was built as a family memorial, no member of the Hohenzollern family took residence in this third castle until 1945, when it became home to the last Prussian Crown Prince Wilhelm; he and his wife, Crown Princess Cecilie, are buried there. Among the historical artifacts of Prussian history contained in the castle today are the Crown of Wilhelm II and some of the personal effects of Frederick the Great and a letter from US President George Washington thanking Baron von Steuben, a scion of the House of Hohenzollern, for his service in the American Revolutionary War. The castle is today a popular tourist destination.